This is an essential pocket-sized reference for the busy veterinary practitioner. It is organized in a quick look-up format with step-by-step diagrams and punchy, concise text, ideal for any clinical environment. Each entry covers a standard procedure that is carried out in everyday small animal practice, whether that is restraining patients, taking a blood or tissue sample, performing an endoscopy, taking an X-ray, or carrying out a biopsy. This book provides a step-by-step pictorial guide on how to do so, accompanied by easy to read text which is ideal for quick access before a procedure or during a consult. The contents are organized by body system, and include examination methods in: cardiology, respiratory medicine, gastrointestinal medicine, urology, gynaecology, andrology, orthopedics, neurology, ophthalmology, otology, and dermatology. The book also includes extensive sections on giving injections, catheter use, transfusions, inhalation techniques, parenteral nutrition, drainage, flushes and bandaging. 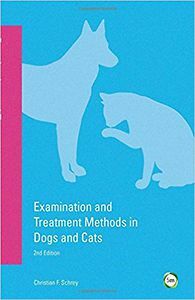 Covering a vast array of standard veterinary procedures, this is an ideal support guide from an established veterinarian, with extensive experience in veterinary practice. It is also an invaluable resource for the veterinary practitioner and veterinary student.